Nicodemus was a religious leader among the Jews in Jerusalem in the time of Jesus. He is mentioned only in the Gospel of John, where he appears three times. In John 3, he speaks privately with Jesus. In John 7, he is present at a meeting of Jewish leaders who are considering how to silence Jesus, and he says, "Does our law judge a man without first giving him a hearing and learning what he does?" To this, others reply, "Are you from Galilee, too?" In John 19, Nicodemus joins with Joseph of Arimathaea in giving an honorable burial to the body of Jesus. The best-known of these passages is John 3, in which Jesus tells Nicodemus: "In order for a man to see (enter) the Kingdom of God, he must be born anew (or born from above), born of water and of the Spirit." Most Christians have understood this as a reference to Holy Baptism, but others suppose the water to be amniotic fluid, and take the reference to "water and the Spirit" as contrasting natural with spiritual birth. 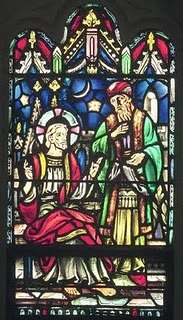 The dialog between Jesus and Nicodemus is given in the form of three speeches by Nicodemus and three replies by Jesus. Since ancient manuscripts have no quotation marks, it is not certain whether Jesus' third reply extends to the end of verse 21, or whether it ends earlier, perhaps as early as the end of verse 12, with the remaining verses to the end of verse 21 being a meditation by the Evangelist. Either way, these verses (including the famous John 3:16) affirm that God sent His Son into the world to bring light and salvation. O God, who led the learned scholar and judge Nicodemus to seek for wisdom from the mouth of your Son Jesus Christ, give to all persons, both scholars and others, minds that are open and hearts that are ready to hear the good news of salvation, not rejecting out of hand what seems strange or unfamiliar in it, but carefully studying to understand it; through Jesus Christ our Lord, who lives and reigns with you and the Holy Spirit, one God, now and ever. Amen.